Boy, it’s been a crazy-busy family weekend. I loved it, but I’m tired! Friday night I went up to Leavenworth, KS to spend some time with my Karate Family. On the way home I stopped at the store to pick up ingredients for Saturday’s baking and made it home around 11:30 pm. Saturday morning it was up and at ’em! The oven was on, the mixer was going, and my house started filling up with the most wonderful scents. 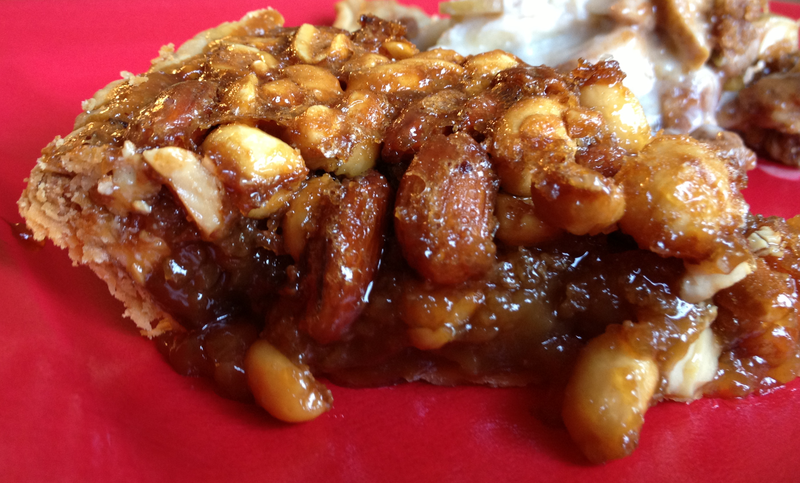 I baked this Mixed Nut Pie (click for recipe), a Sweet Apple Pie, and Alex’s Cake – a pumpkin butterscotch fall treat for my favorite son-in-law. Then the pies and I were off to a Wiffle Ball Tournament hosted by Friends Who Are Family in Peculiar, MO. Sadly, my team lost again this year, but that’s OK because there was pulled pork and home made potato chips to console me. Even though my team went down in flames, it was still a great day! After the fun, it was back home where I fired up the oven once again and baked a Pink (Strawberry) Cheesecake for Cutie Patootie #3’s first birthday celebration this afternoon in Liberty, MO. Whew! Can you see why I say it’s been crazy-busy? I’ve been all over town, with a bunch of baking and shopping in between trips. Tonight I’m trying to unwind and prepare for the upcoming week by sitting in front of the TV. And blogging. I wanted to get at least one of the recipes up tonight; I’ll get the others up as I find time. 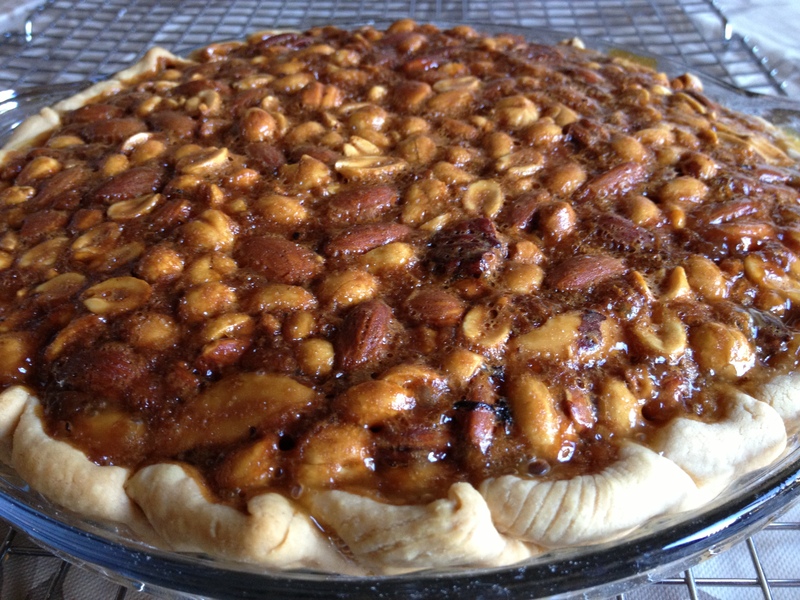 This pie is a lot like a pecan pie. The recipe calls for mixed nuts and I took that to mean a can of mixed nuts, but then I realized you really could use whatever combination of nuts you like. Personally, I like the combination in the mixed nuts can so I’d use them again. This isn’t a hard pie to make. The most difficult step, I think, was boiling the syrup and sugar to make sure the sugar dissolves completely. I used a refrigerated pie crust, but you might have more patience than I do and choose to make your crust from scratch. If that’s the case, don’t pre-bake the crust, and don’t prick the crust with a fork before adding the filling! If you do, the filling will seep under the crust, stick to the pan, and make a mess. The pan will be very full, so you may want to pour most of the filling in the crust, put the pie in the oven, then add the rest of the filling until the crust is full. Nuts are a great addition to fall and holiday menus. I think you’ll enjoy the change – especially if you’re not particularly a pecan fan.